Last week end Dennis and I drove to Tamworth for Tony and Amber’s baby shower. We had a great week end which began with afternoon tea to get everyone in the mood to play zany baby games. The shower favours that I made went over well and Amber received lots of lovely, lovely gifts. To thank everyone for their thoughts and efforts I’ve now made these delightful thank you notes for Ams to post out. I’ve stuck with the Onesie theme and in true fashion, so as not to get bored making many cards that are the same, I chose different colours and shapes to liven the project up a little. The Onesie pattern was ‘given’ to me by the Amazing Dianne Pickford from Alstonville. Dianne and her husband Ian, stayed with us this week. Dianne and I did some serious upline/downline bonding/training (read here catching up), Ian climbed Bald Rock on Wednesday (Dennis was not offering to accompany him on that escapade!) and on Thursday Dennis and Ian went to Glen Lyon Dam and had a bit of a ‘check-out’ for future camping/fishing ventures. Anyways, back to the Onesie. It’s made with the very large oval punch, window punch and the smallest oval punch. Very fiddly, and I’d probably baulk at doing this many again, however the end result (as you can see) was worth it. Don’t you just love that one with the pom pon trim???? I’ve so fallen in love with that stuff! 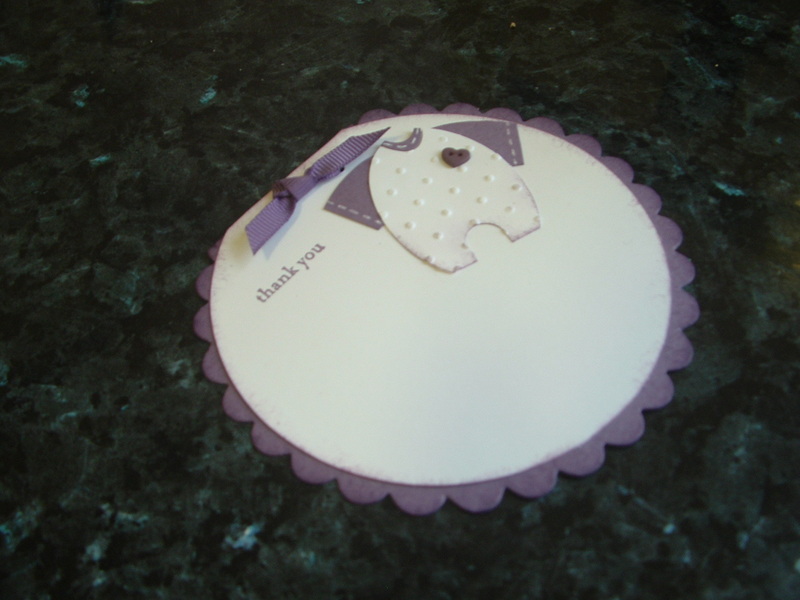 This is a closer view of the round thank you card. I cut the outter layer out on the big shot and Pale Plum Cardstock and the smaller Whisper White circle using the circle scissors. Lots of sponging with Elegant Eggplant ink and Elegant Eggplant grosgrain ribbon, and a thank you from the Teeny Tiny Sentiments stamp set. Bits of the Elegant Eggplant cardstock on the outter circle and the Onsie have been highlighted with a white gel pen. 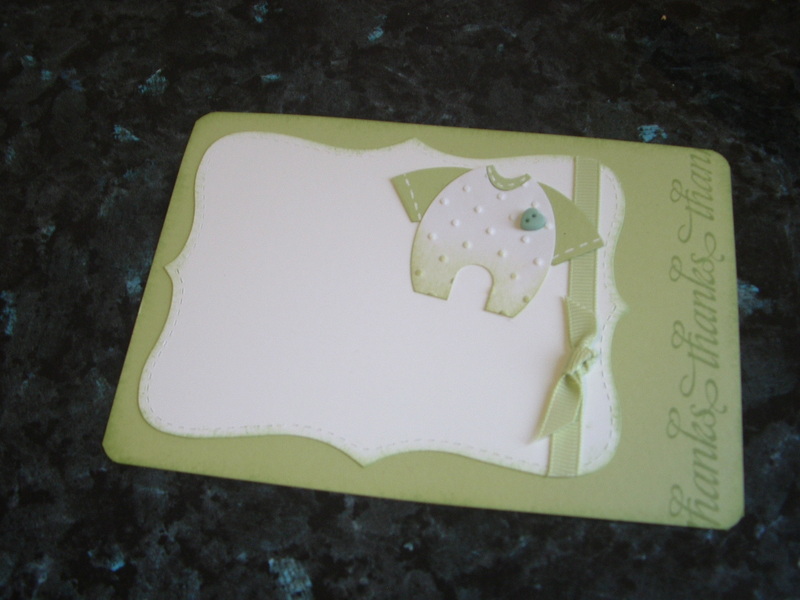 This one is using Certainly Celery cardstock, ribbon and ink. The white piece is cut on the Big Shot using the Top Note Die and sponged with Certainly Celery ink as well.